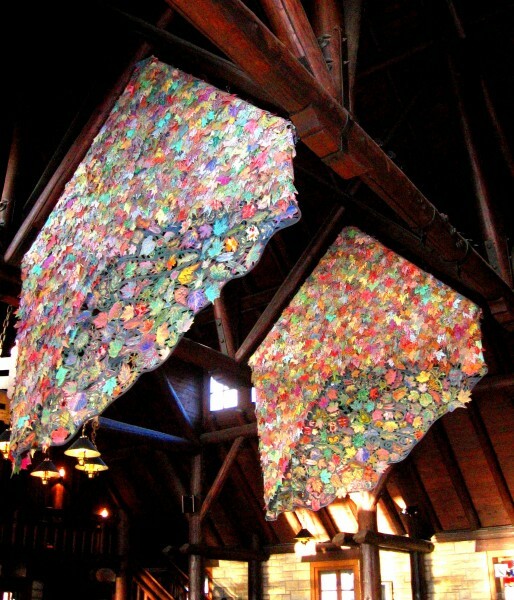 The Four Rivers Fabric Art hangs in the center of the Great Room at Pere Marquette State Park Lodge. Consisting of 4 large hangings, the piece depicts the world of nature surrounding the Park and the Illinois, Mississippi, Missouri and Ohio Rivers. Celebrated artist and art professor at Southern Illinois University Carbondale, M. Joan Lintault, created the piece. She was selected to create a piece of art in a competition sponsored by the Illinois Art in Architecture Program. State Law requires that public art be put into every state building with 0.5% of each building’s construction cost be set aside to acquire the art. 6,000 cotton leaves of every hue, with no two alike, are layered on fabric, invoking the image of leaves on the river bank or floating on the water. In addition, there are stuffed turtles, fish, birds, frogs, butterflies, snakes, dragonflies, and ticks to add dimension. Everything was hand cut, hand-dyed and hand-painted. Lintault used 358 yards of cotton, 135 yards of fusible fabric, 68 yards of nylon netting, 96 yards of hand died cheese cloth, lots of cotton cording and over 30,000 yards of thread.